Do you still think it’s crazy that I did the Tough Mudder? I still can’t believe it sometimes. Today I’m linking up with Marcia, Erika and Patty for Tuesdays on the Run. Check out their sites for a variety of awesome running posts, including this week’s theme of post-race celebrations. I do touch on that a little bit with my Tough Mudder Training Tips! This year I completed the Warrior Dash (5K) and the Tough Mudder (10.1 miles). I never thought I’d become a “mud runner”. It’s been a really fun and challenging experience and I’ve learned a lot along the way. You don’t know what you don’t know, right? When I started training for the Tough Mudder, I was terrified. 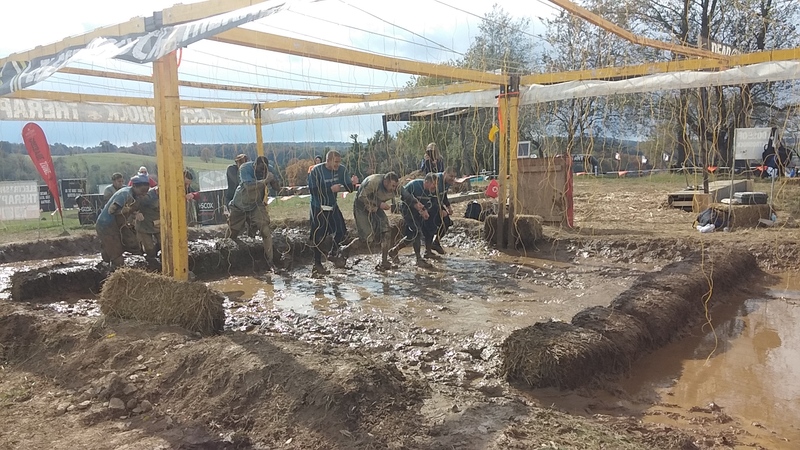 I had no idea what I was doing and how I would handle this insane obstacle race! But I had a great team of people who were motivated to get ready. Based on my experience, I thought it would be helpful to share what it takes to train for the Tough Mudder and similar mud/obstacle races. These tips should help put you at ease to know what it takes and what’s really involved on the big day. The more time you give yourself to train, the more confident you will feel about the race. 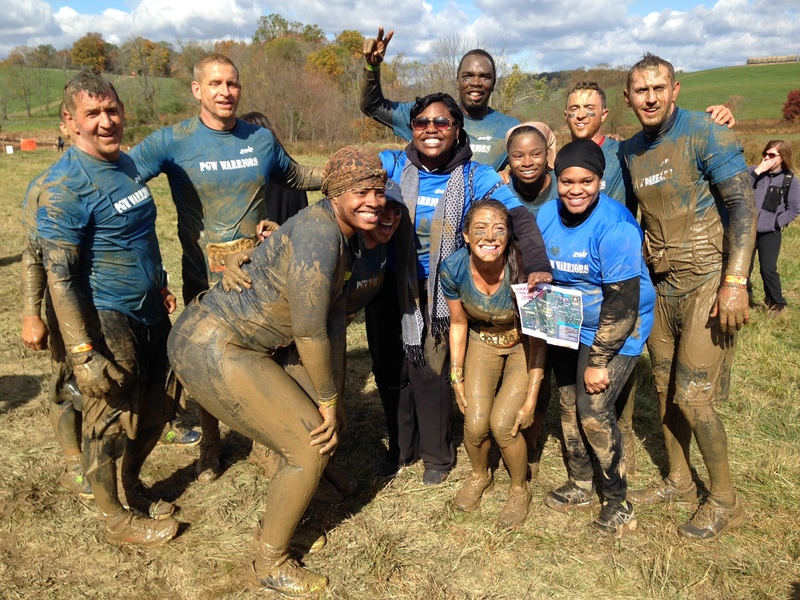 My team signed up for the Tough Mudder sometime in July – the event was held in mid-October. But I can’t really say that I trained for Tough Mudder until after August. I used the Warrior Dash as a “benchmark” to see what I needed to focus on for Tough Mudder. Unfortunately, the Warrior Dash is MUCH easier than Tough Mudder physically, but it helped me be comfortable with getting a little messy! Treat the Tough Mudder like any other race and come up with a training plan or search online. You can run and strength train for several days a week, but you need to be consistent in order to be successful. You can’t exactly train for this one! Do you really want to go into a race blind? Equip yourself so you can be physically and mentally ready for the big event. The Tough Mudder website has lots of resources on what the obstacles are and what types of workouts you should do for each obstacle. Usually, they don’t reveal the exact course until a week leading up to the event, but you can at least get a head start. If I didn’t know that the Arctic Enema existed in advance, I really don’t know if I would have attempted it on race day. And now I can say how proud I am to have plunged into a few feet of ice-cold water! Parkour Gym Facilities – we went to an awesome place in Philly. It helped us learn techniques on how to climb walls (including Everest) and jump and land safely. Tough Mudder is famous for its crazy obstacles, but you’ll have to run too! I saw so many people struggling with running and a lot of people got painful cramps along the way. I truly believe that some of it was caused by a lack of training. If you follow my blog, you know that I specifically trained for the Tough Mudder for over 6 weeks with a plan that was similar to training for a half marathon. Tough Mudder is all about endurance. Even though you’re not running more than 1-2 miles at a time…it adds up. The only thing that took me by surprise was that the terrain on the course was very hilly! And Killa Gorilla had really steep hills! Here are my recommendations on how to prepare for the running. Train as if you’re running a half marathon – the more often you run, the easier it gets. 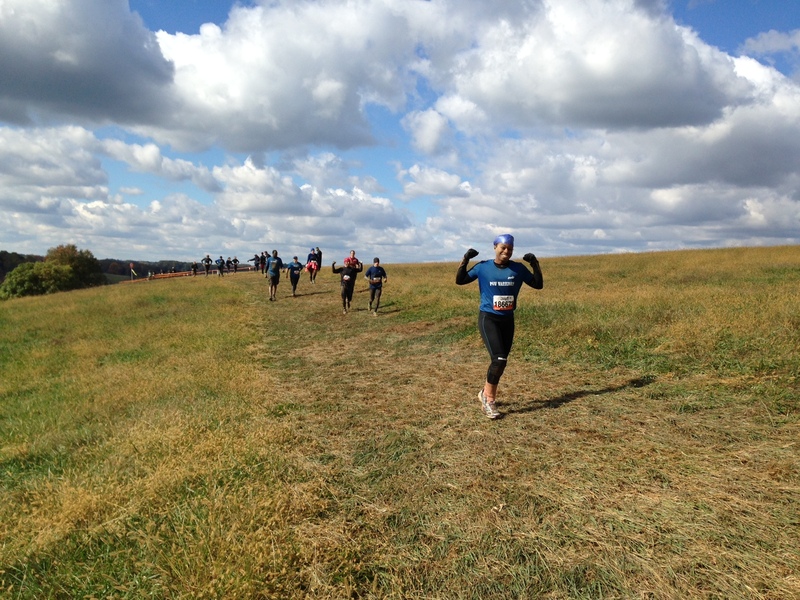 Focus more on hill work than speed work – don’t worry about speed, the Tough Mudder isn’t a timed event. If you want to finish strong, learn how to run hills! Do as much trail running as possible – this is more realistic to what your Tough Mudder conditions be like. Find a trail and have fun – the muddier and rockier, the better! Our Tough Mudder was in mid-October, so generally the weather could be as warm as the 70’s or as cold as the 40’s. Unfortunately, our event was in the 40’s and 50’s…brrr! When you’re preparing for Tough Mudder, take your workouts outside and practice in different conditions. Run in the rain, climb the monkey bars in the cold, or do bear crawls when it’s really hot. This will not only train you physically for tough conditions but will give you a mental edge that will help you get through the race. The Tough Mudder is a pretty intimidating event, but please don’t overtrain to the point of injury! I tweaked my left knee a few weeks into training and was so scared that I caused serious damage – thankfully, I didn’t. Make sure you have enough rest days during the week. This isn’t a cheap event…preserve your full energy and intensity for the race! Now here’s what you’ve probably been waiting for: what to wear?? Here are my recommendations based on my personal experiences with the Tough Mudder and Warrior Dash! Of course, you can wear a banana suit or hardly anything at all if that’s your thing, but for your first time, it’s important to make sure what you’re wearing is secure, comfortable, and able to handle a variety of conditions. Whatever you wear, make sure it has been tried and tested! No new stuff on race day – especially for a mud run! Clothing with wicking material – shirts, tanks, pants, capris. You can buy these at any athletic store or even Target or Wal-Mart. Compression clothing – socks, shorts. I wore compression socks from Road Runners sports similar to these. I’d like to think they helped keep my feet secure. Ladies: Sports bra and swim suit bottoms – My friend Jen gave me this tip and I highly recommend going this route to ensure maximum comfort. Head covering that will stay secure – swim cap, headscarf/bandana. I wore both, but the swim cap was clutch! Make sure it’s not too tight! Keep your hands clean and dry! Loose clothing, especially cotton! – you will get wet, and you will be covered in mud…the last thing you want is to drag along heavy, soggy clothing! Light colored clothing – the lighter the clothes, the harder it will be to clean…I learned that from my white running socks at the Tough Mudder that are still brown after multiple washes! Loose hairstyles if you have long hair – unless you really like getting your hair caked in mud, I’d recommend braiding or bunning up long hair. GPS Watch/FitBit – first of all, Tough Mudder is NOT about finishing time. Second, why risk damaging a $200-$300 watch? And do you really need to know how many steps you did?! GoPro Camera – it looks cool, but only bring it if you’re a veteran Mudder. Prescription Eyeglasses – I didn’t wear my glasses and can generally see fine without them so that worked for me. Even if you have straps to keep them from falling off, you could easily scratch and destroy your lenses. Jewelry – just keep it home. Would you believe that I forgot to bring an extra pair of shoes after the race? Make sure you make a list and check it MORE than twice! I brought all my supplies in a backpack. I also brought along a garbage bag that I would use to carry my muddy clothing. If you’re lucky, you’ll have an event where the parking is free. But if it’s not free, take advantage of carpooling and split the costs amongst your passengers. It’s also a lot more fun to head to Tough Mudder in a car full of people! Also, if you can get someone else to drive for you – do it. The ride back must be especially miserable after completing a Tough Mudder if you’re in the driver’s seat. We did the Tough Mudder on Sunday with a 10 am start time, so we didn’t have any problems with traffic. But if you’re participating on a Saturday, especially first thing in the morning, beware! One of our awesome spectators surrounded by crazy muddy people! The Tough Mudder charges for everything, even spectators. When my sister and I went to watch my brother we had to pay $20 a person, and because of the traffic, we never even made it in to see him! Just terrible. But if the spectators actually make it to Mudder Village, it’s great because they can hold your stuff (instead of $10 for bag drop) and take great pictures of you throughout a majority of the course. We actually had better pictures from our spectators than the professional photographers! Spectators are also great for the most obvious reason – they cheer you on and support you! The last thing you want to do is get to the Tough Mudder and freeze or pass up an opportunity to do something that you’d never do otherwise! It’s all part of the experience! Tough Mudder is such a positive environment and everyone’s there to have a good time. Don’t think about the mud, just think about the bragging rights you’ll have to share later! Don’t try to be a hero! 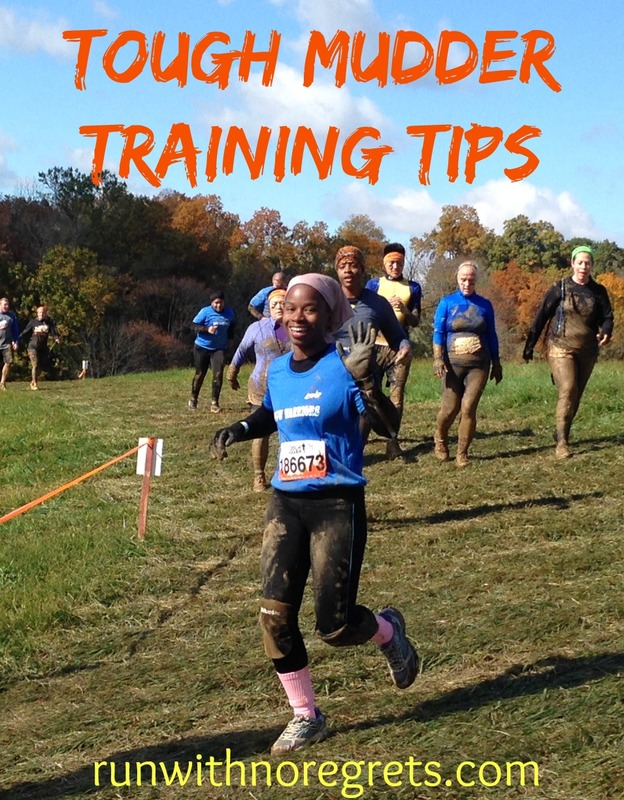 In my recap of Tough Mudder, I shared that there were certain obstacles that I did not do for safety reasons. I’m not a strong swimmer so I didn’t feel comfortable plunging into 5 or 10 feet of water, especially towards the end of the 10-mile course. And I don’t feel bad about that. You can easily walk around an obstacle that you don’t want to or can’t do and NO one will judge you or shame you for it. And the good thing about Tough Mudder is that you don’t have to do burpees to move on! Everyone got to help each other on this obstacle! Again, don’t try to be a hero. Most obstacles are a team effort. If you work together, you’ll get through it together! There are several climbing obstacles where you need someone to give you a boost. People are happy to give a helping hand. And if someone helps you, be sure to help someone who’s behind you! Trying to go it alone could cause you to get hurt or hurt someone else if you’re not careful. You can’t prepare for everything. 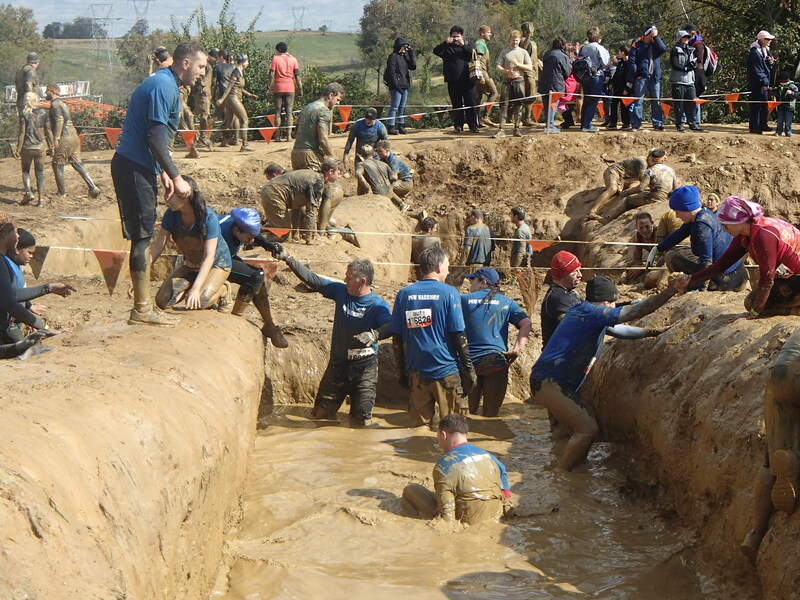 There could be extra mud pits that you didn’t know would be on the course and there may be some obstacles that had to be removed at the last minute. Not to mention, the weather is always a wild card. All I can say is to embrace it and have fun! It sounds glamorous, right? Complete your mud run and feast with a turkey leg and some Shocktop beer with your friends and family. Well, I can tell you that after such an ordeal, the first thing you may want to do is get cleaned up, go home and get some sleep! We didn’t stay long enough to “party” at the Warrior Dash or Tough Mudder, but I made sure to get the “free” beers that I earned. It didn’t help that since we were one of the last teams to finish, the “party” was dead and almost completely packed up. There wasn’t even any music! 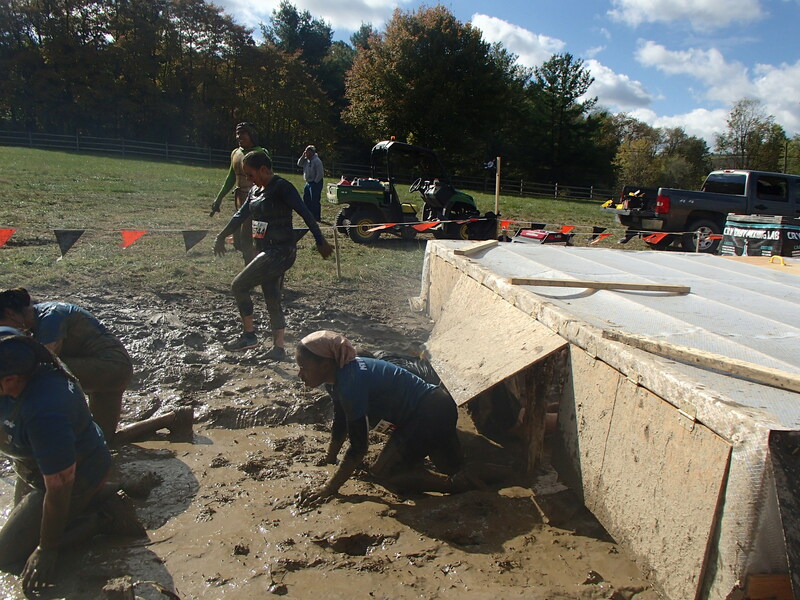 Changing clothes just may be the most unpleasant experience at these mud events. Doesn’t it sound fun to hose yourself off and then change in a tent that may have mud all over the ground? The Warrior Dash had really awesome showers, which you can see. 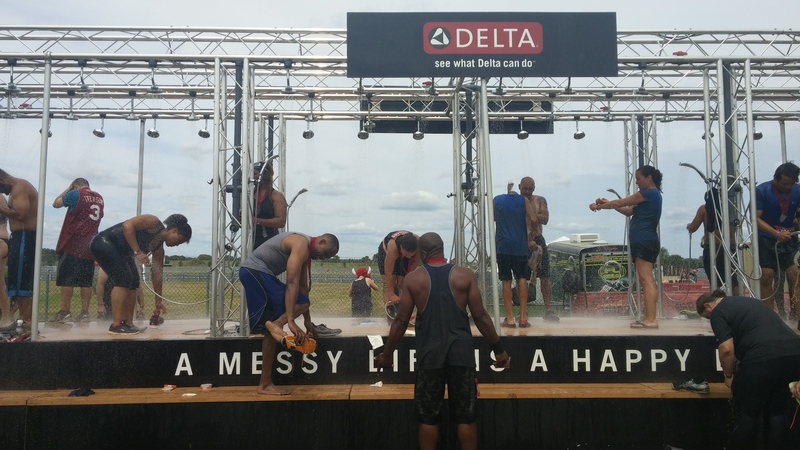 The Tough Mudder’s showers weren’t that bad but you’re still using a garden hose to get clean. When it’s cold outside, it’s a pretty miserable experience. Changing in the tents is really awkward…make sure you bring one towel to stand on and one towel to use to get changed with a little bit of dignity. I also recommend wearing flip-flops – these are what I forgot to pack this time! 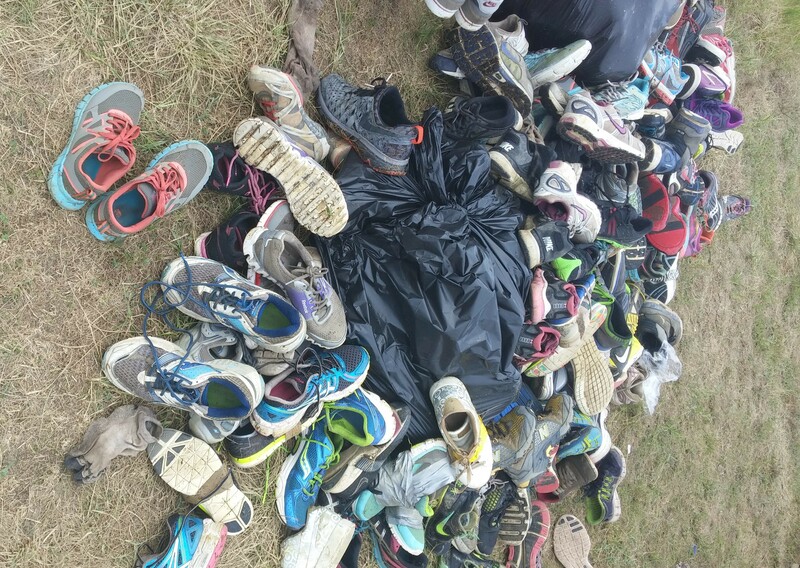 Tough Mudder will take your used shoes at the end of the race and donate them to charity. I actually think that both of my running shoes may have been worth saving, but I’m considering buying trail shoes in the future so I thought this would be a worthy cause. Now that you’re relatively cleaned up, it’s time to work on your recovery. Once the adrenaline is gone, you’ll probably start to feel sore. Stay hydrated with water (not beer!) and keep a foam roller in the car. Hopefully, you’re not feeling any serious pain or injury from the event. Work on stretching your back and shoulders, quads, hips, hamstrings and calves. My hips were killing me the next day to the point where I could barely lift up my leg to get in my car. If you need ice, use it. But I’d personally stay away from painkiller medication unless it’s really serious. The Stick, a great massage tool! I don’t have laundry in my apartment, so I took my Tough Mudder clothing to the laundromat – washing them separately, of course! They should be good as new after your wash so that you can wear them to your next mud run – just kidding! No matter what anyone says to you, completing the Tough Mudder is a great accomplishment. You were able to do something that millions of people would NEVER try to attempt. I can personally say that I’m proud that I completed the Tough Mudder, even if I never do it again! Enjoy the experience and be grateful that you’re healthy enough to do it! If you’ve run a mud run like Tough Mudder, what tips would you share? Does the Tough Mudder seem a little less daunting now?